NTC’s JTT is a very popular program. The program is a travel team and NTC teams have enjoyed great success in this league earning multiple league and district championships. Join the fun! 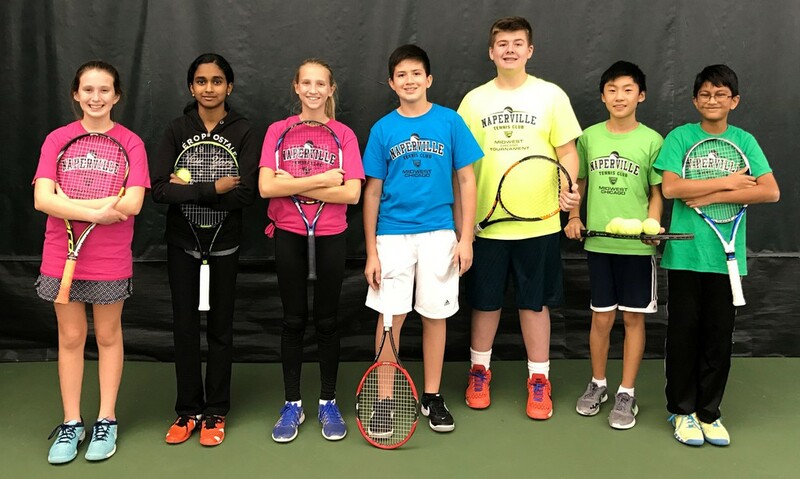 Naperville Tennis Club’s JTT Travel Team Program provides a positive competitive learning environment to develop our players both on and off the courts. Team Tennis is fun, which develops players’ passion for the game so that each player has a strong desire to fulfill their potential. Match experience is critical in player development and drives their improvement. Oncourt coaching helps players learn to make decisions and execute them under game pressure boosting their confidence. This year’s team program has some new features including a newly designed JTT t-shirt and a more robust schedule which includes some drills, practices & inter-club in addition to intra-club tennis fun. The complete schedule will not be available until Naperville Tennis Club and the other clubs in the league have submitted their teams and court availability, but here is what we do know. 10U (orange & green), 12U, 14U Divisions: October through May with both singles and doubles matches. Signup deadline 9/28/2018, then as needed to complete rosters. 6 intra-club matches, approx. 2 hours, 3 home, 3 away – For 12U and 14U, some may be double headers (in which two matches are played during the event, approx. 4 hours), rather than dual (one match between two teams) which is standard for 10U Green. 10U Orange are all 90 minute dual matches. Matches include singles, doubles and mixed doubles with players alternating play and staying on the court to cheer on their teammates as they compete. An NTC coach is on-court at all matches, providing feedback and encouraging team camaraderie. 4 additional events – 1 is a Kickoff Event on Saturday 10/20, one is during the season, one is District Playoffs, and one is a Season Finale Event. The additional events will be a combination of drills and games to sharpen the team and build team camaraderie, help with partnering formation, and allow the coaches to best coach their teams. All events include refreshments, generally pizza. A newly designed JTT t-shirt is included in the JTT Travel Team Program this season. The per player cost for the JTT season is $475 for NTC JE Members and $575 for non-NTC JE Members. 10U Orange (because of 90 minute matches) are $400 for NTC JE Members and $500 for non-NTC JE Members. The JTT fee will be submitted in two payments, $100 now to hold a spot (which includes USTA JTT league fee), and the remaining amount through a link you will receive when your player is placed on a team. Advancing vs Non-Advancing Teams. USTA JTT Teams are categorized as either advancing or non-advancing. Teams which are advancing require that all team members have a USTA membership; non-advancing teams do not require USTA membership. Advancing teams that do well, have the potential to advance beyond this area for ever-increasingly competitive matches all the way to a national level competition. Advancing is not available for the High School division. League District Championships are in May, with those teams progressing having Sectionals in Indy on 7/27-7/28/19. High School Division: November through February - all doubles, all the time! Signup now with the deadline being 10/14/18. 4 matches – between December and February. High School Division events are usually double headers (two matches are played), but may also be scheduled as quads in which players will play 3 teams. This is determined by the court time available at various clubs and the number of teams in the league. High school matches include doubles and mixed doubles with players alternating play and staying on the court to cheer on their teammates as they compete. 2 additional major events - one preseason and to include some drills, games, doubles strategy, and a lot of fun. The other is a Season Wrap-up Event! The per player cost for the JTT season is $245 for NTC JE Members, and $345 for non-NTC JE Members.. This will be submitted in two payments, $100 (which includes USTA JTT league fee), and the remaining amount through a link you will receive when your player is placed on a team. The high school division cost is less as there is a lower team to pro ratio than with the younger age divisions. If the High School Division is able to add additional matches, something that was requested last season, those dual matches will be $50/NTC Member and $60 for non-NTC Members. Weather. Every attempt will be made by every club to reschedule weather/snow cancellations – NTC will reschedule with, worst case, the event being an interclub one. Make Up Policy. Any match a season-committed team member does not play, except last minute (48 hour) cancellation without an available alternate, the player will be provided a free iCompete Event Voucher for them to use at an NTC-hosted event of their choice. Roster and Team Size. Ideally teams are formed with a roster size of 8 or 9 players with the minimum allowed for competition being four. When possible, clubs will add a court so that larger teams can get more tennis played. When that is not possible, NTC will limit their teams to six players. The first match in which not all of the available players can be fielded, players will be selected on a first come first served basis with, ideally, 3 boys and 3 girls. Those who were available and have sat out, 1) will receive a voucher for an NTC hosted iCompete Event and 2) will be recorded as having sat out. They will not sit out for another match for which they are available until everyone else on the team has sat out once. If a second sit out is needed, it will again be decided on first come first served availability basis. JTT Players will receive positive reinforcement to develop self-confidence. They will be encouraged to take risks and make mistakes. Learning through risks and failures fuels creative point play and supports active positive decision making on (and off) the court. We’re excited to launch the JTT Co-ed Travel Team program for the season – hope to see you on the courts!